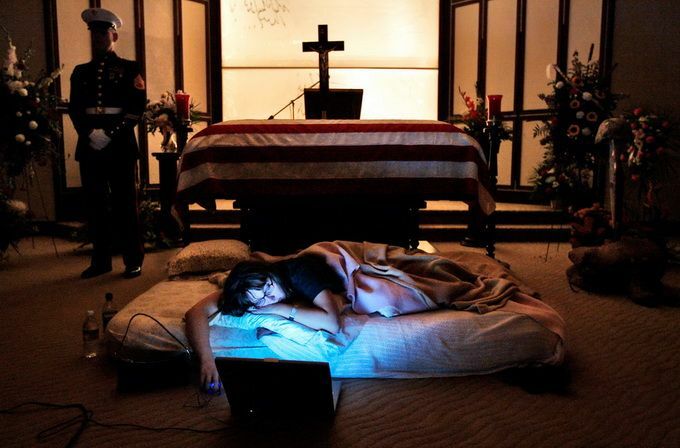 (Above Video) Just A Common Soldier, also known as A Soldier Died Today, is one of the most popular poems on the Internet. 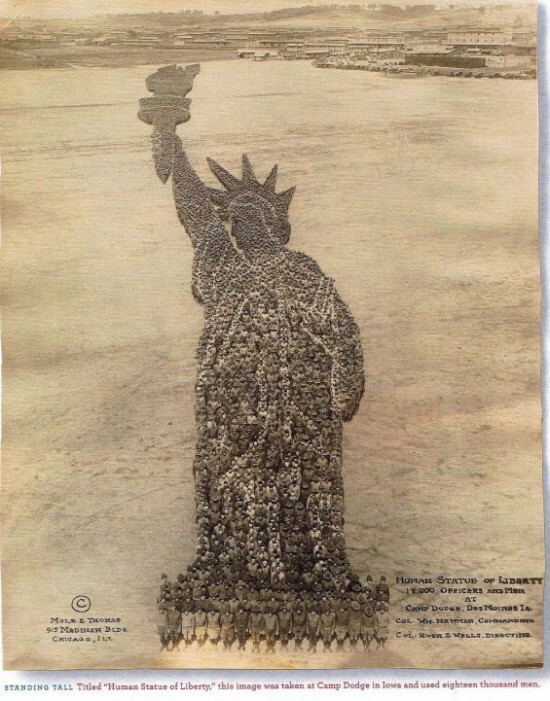 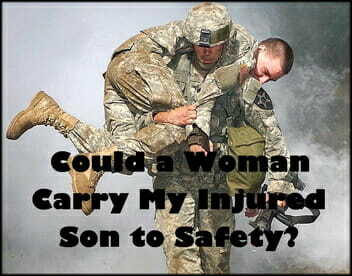 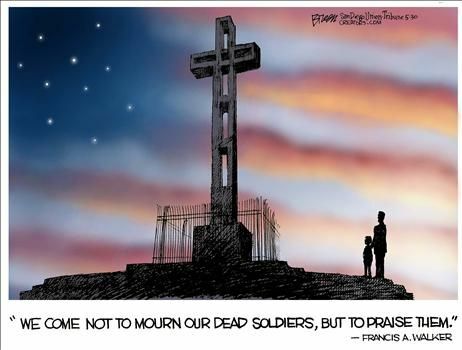 Written and published in 1987 by Canadian veteran and columnist A. Lawrence Vaincourt, it now appears in numerous anthologies, on thousands of websites and on July 4, 2008 it was carved into a marble monument at West Point, New York. 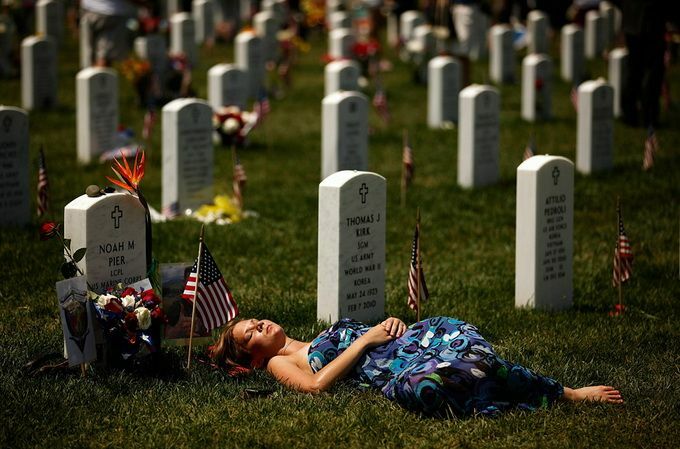 This year marks the poem’s 25th anniversary. 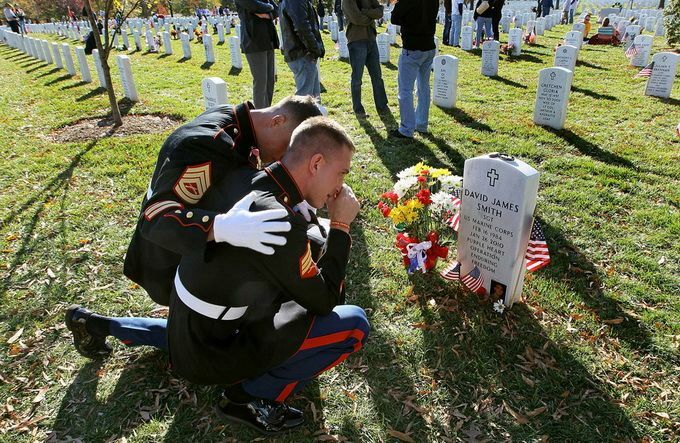 (Via Gateway Pundit) Brothers Forever–Travis Manion and Brendan Looney were roommates at the naval academy and became as close as brothers. 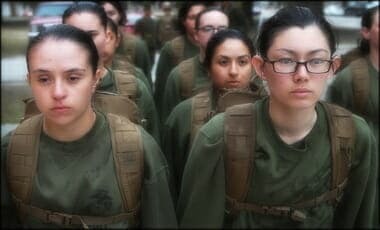 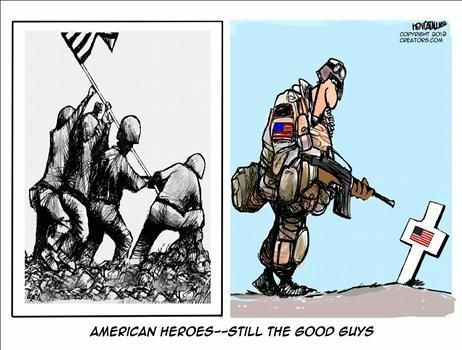 One became a Marine stationed in Iraq, the other, a Navy Seal in Afghanistan. 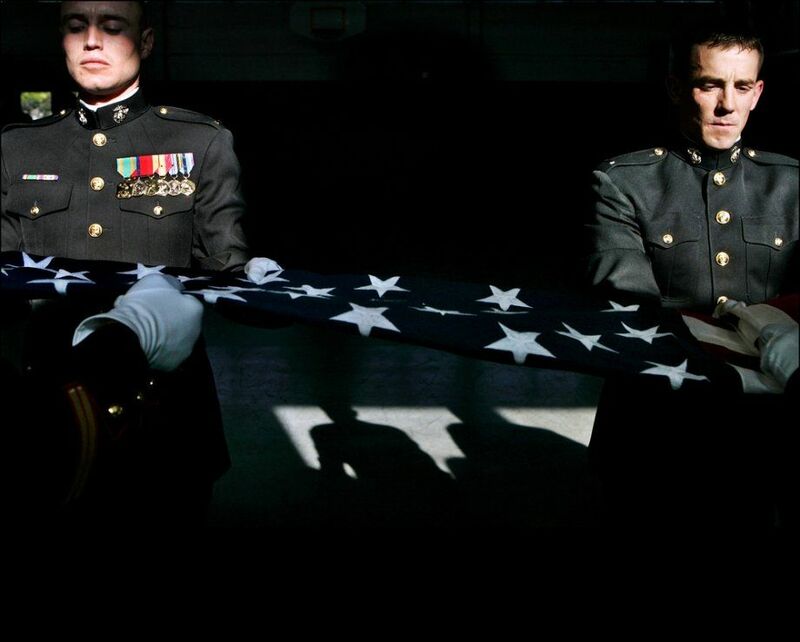 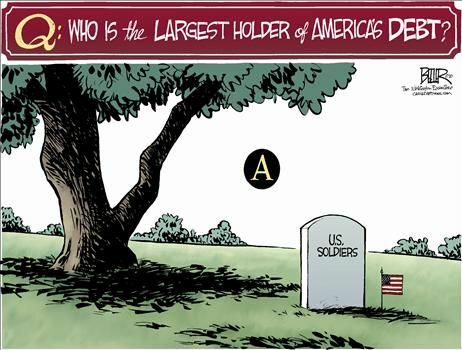 Both died in action years apart and were laid to rest side-by-side in Arlington’s National Cemetery. 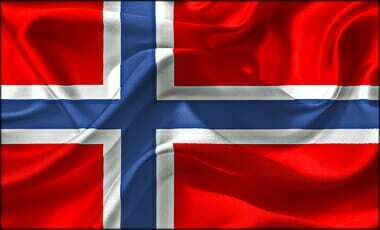 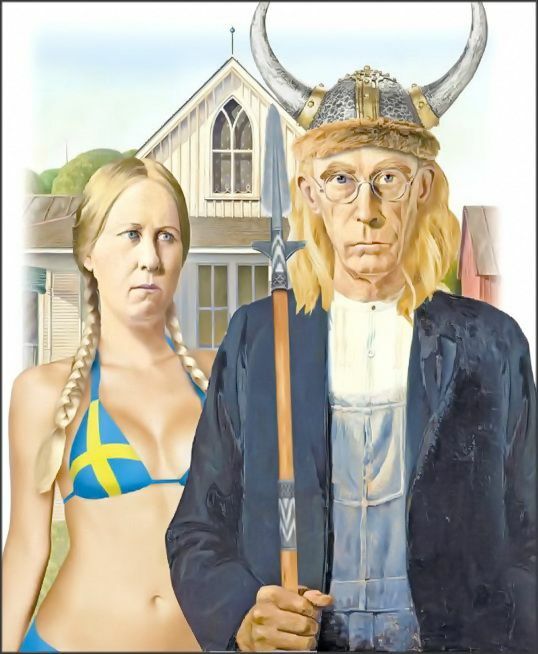 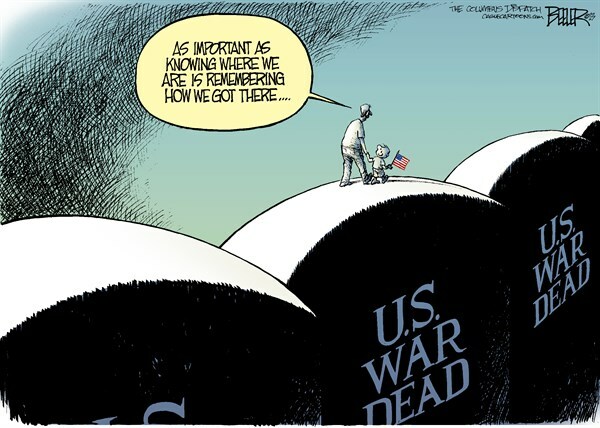 us down in green pastures. 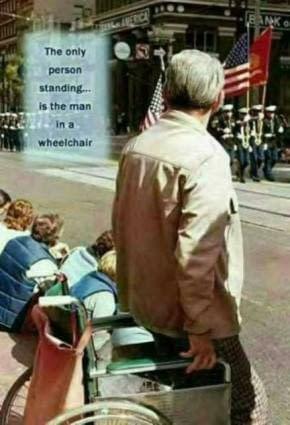 Who can get people out of wheelchairs. 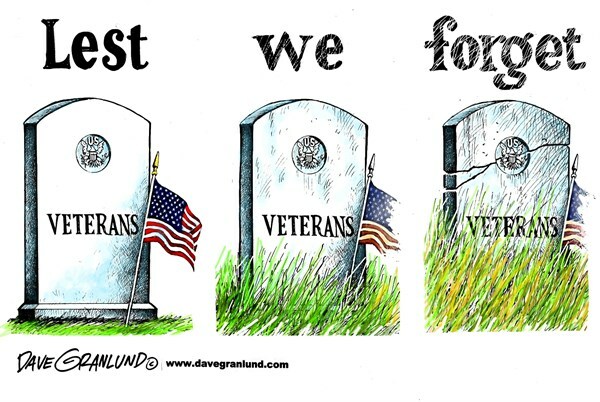 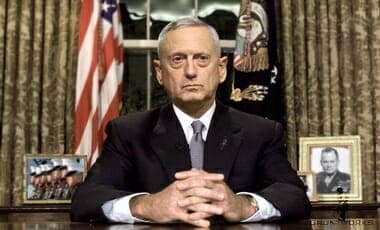 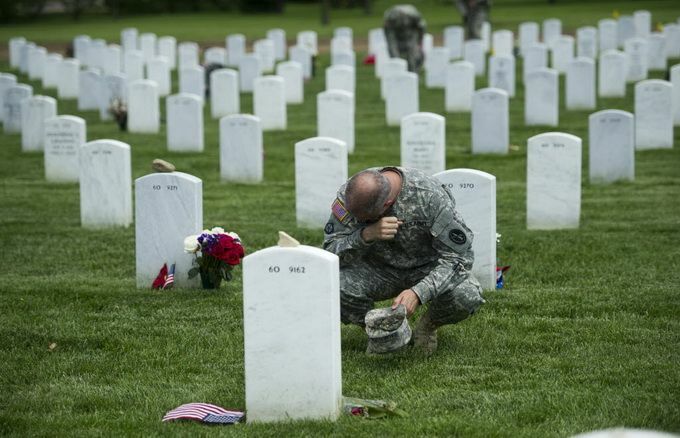 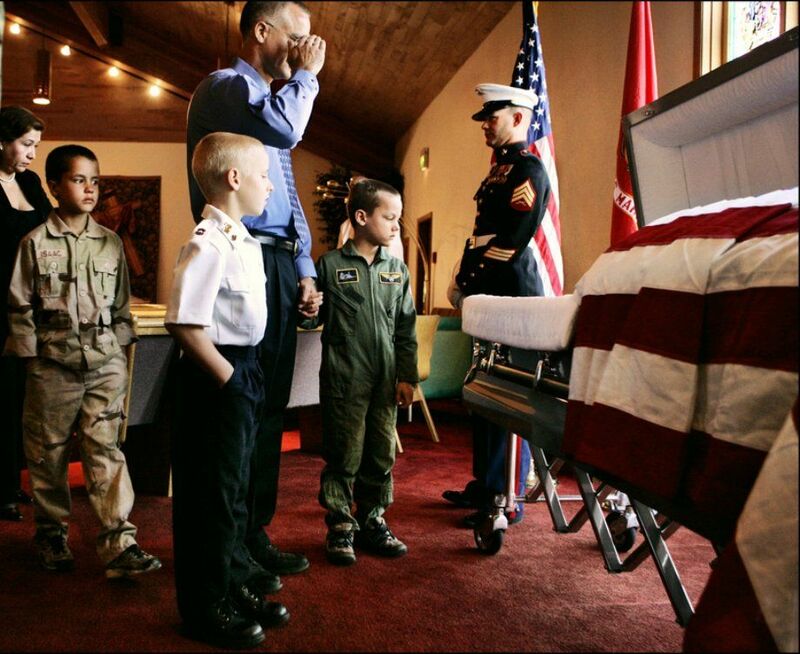 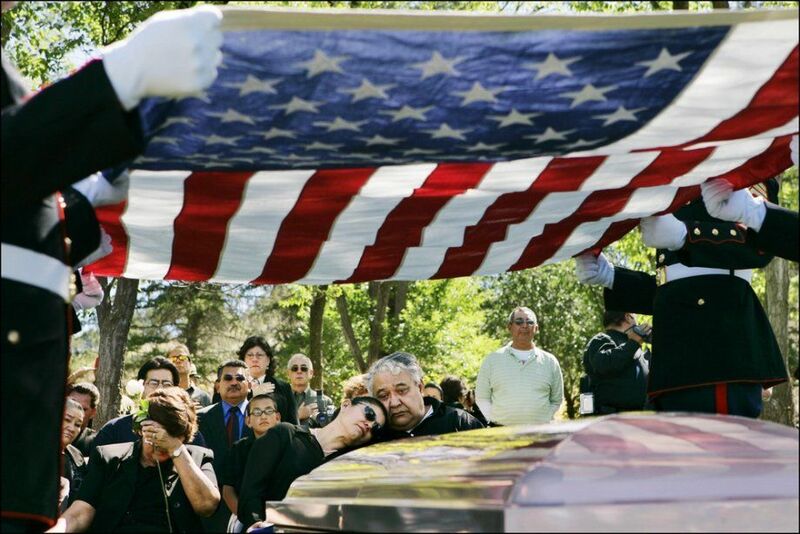 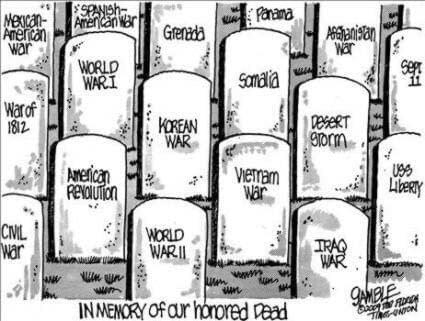 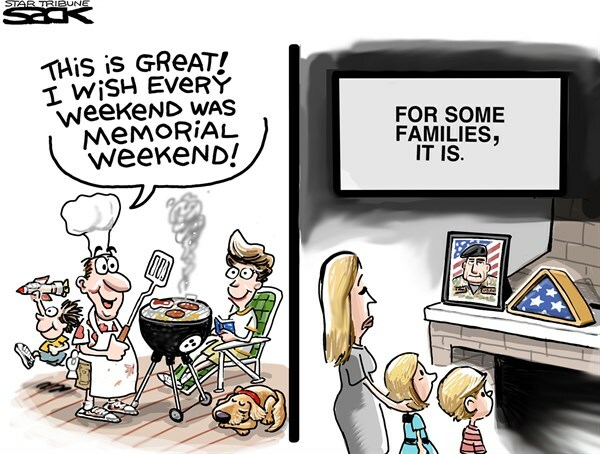 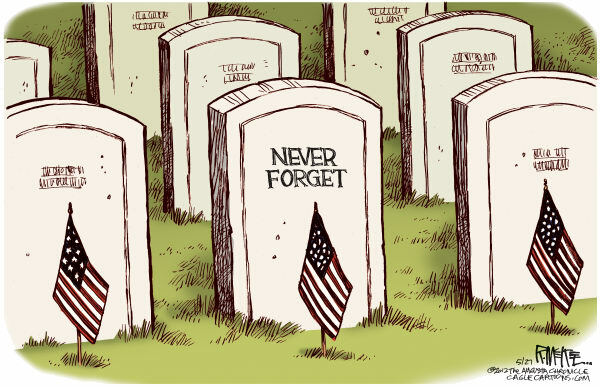 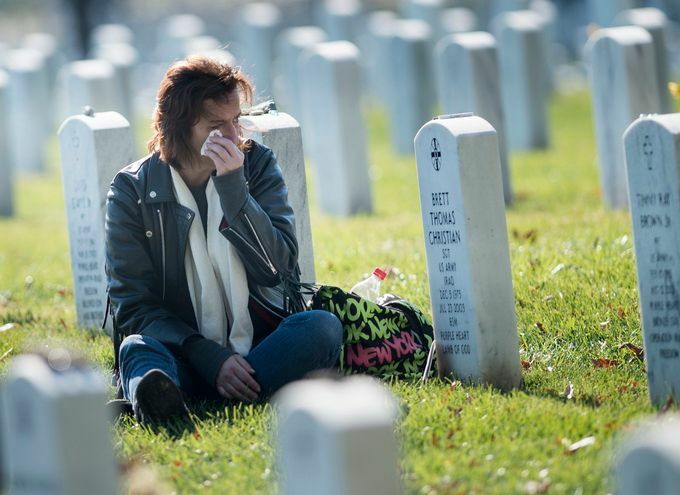 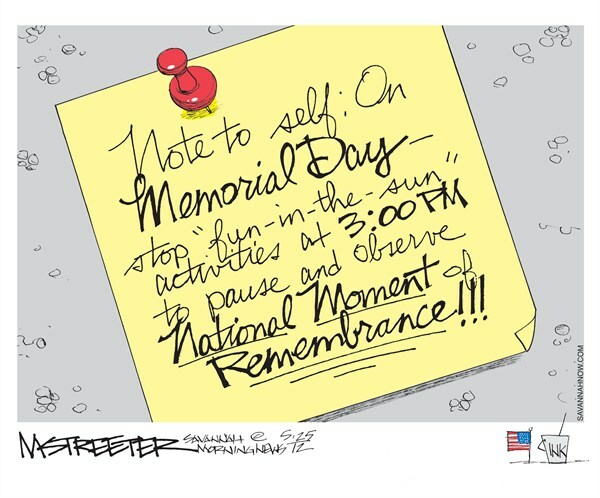 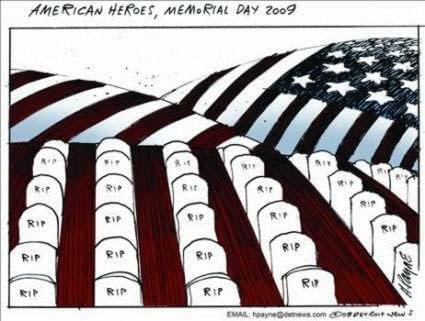 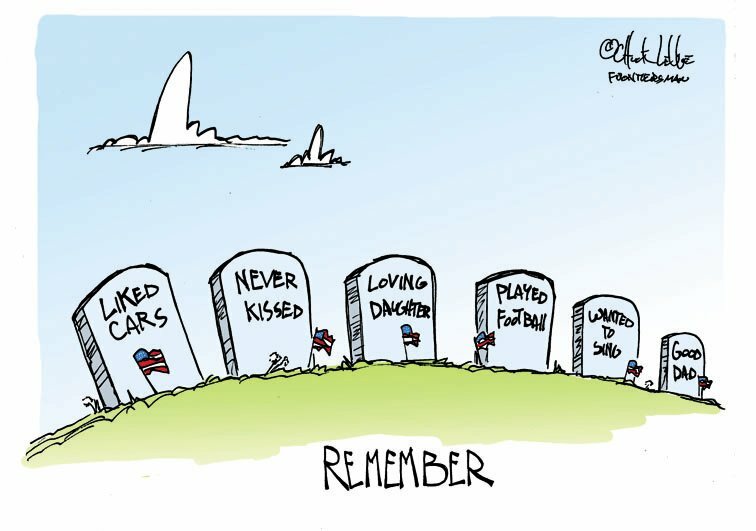 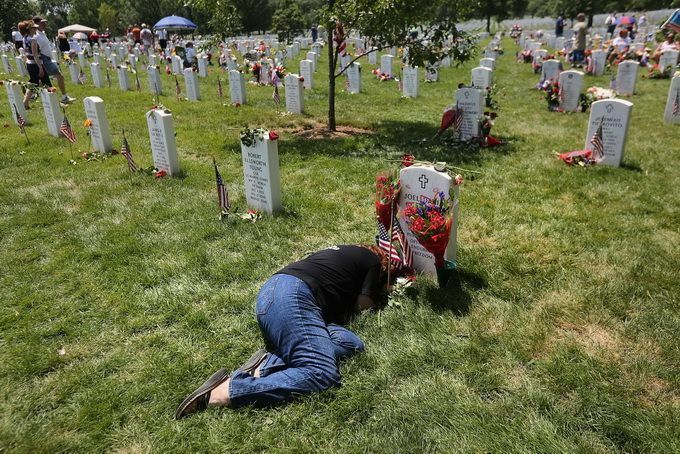 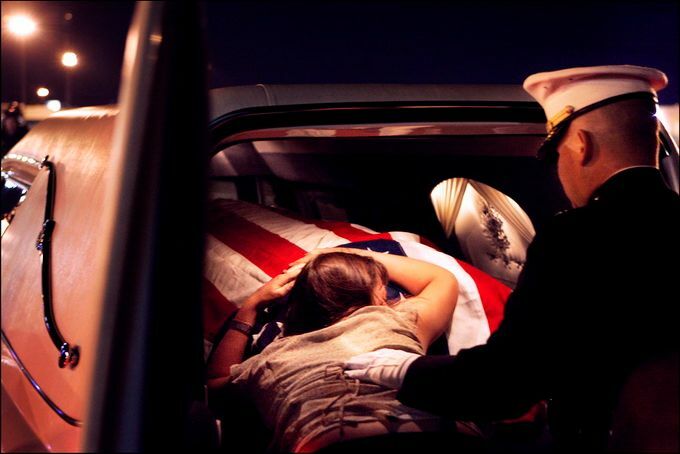 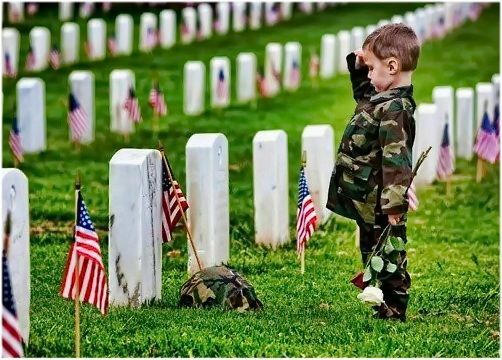 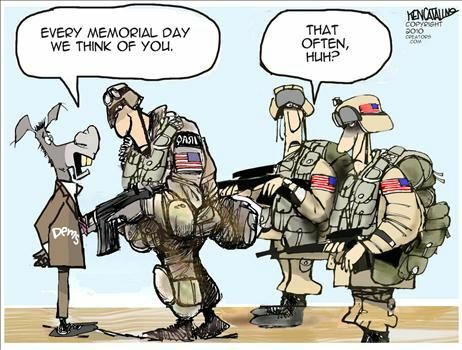 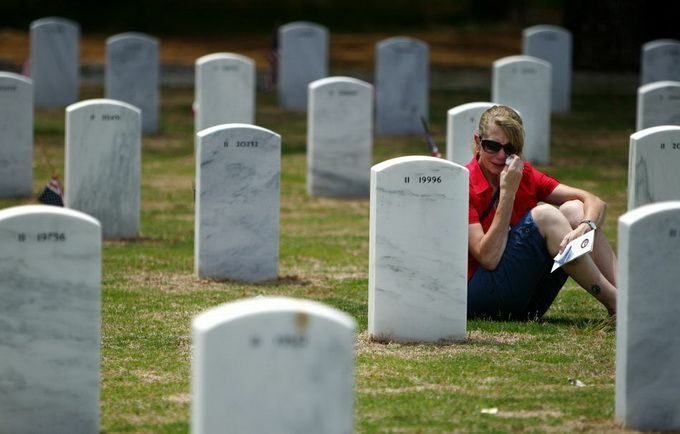 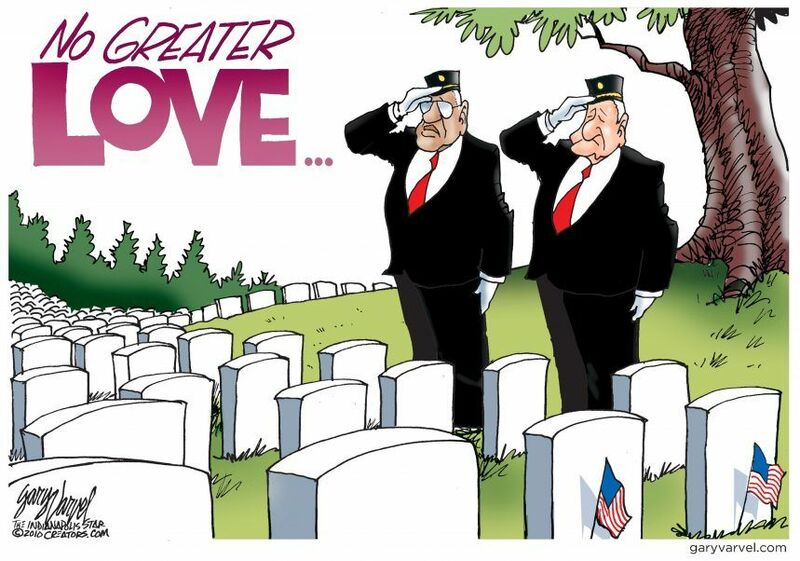 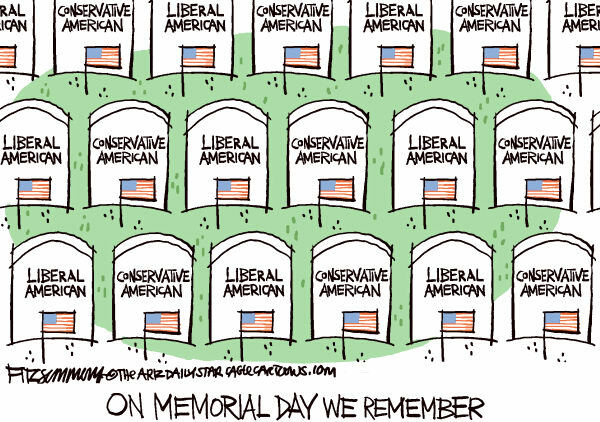 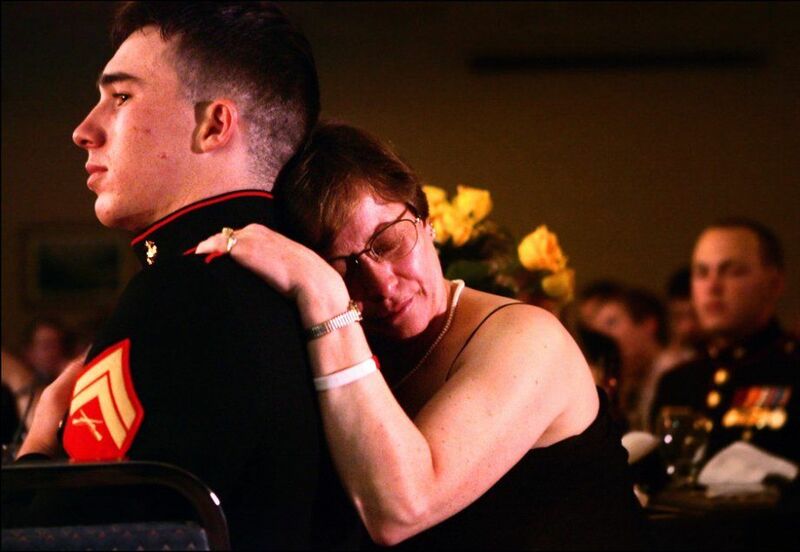 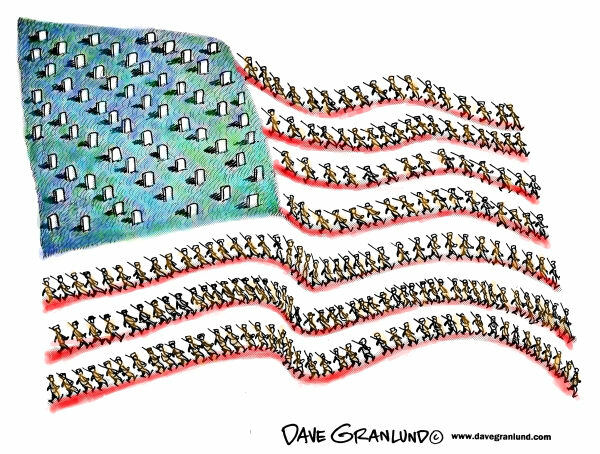 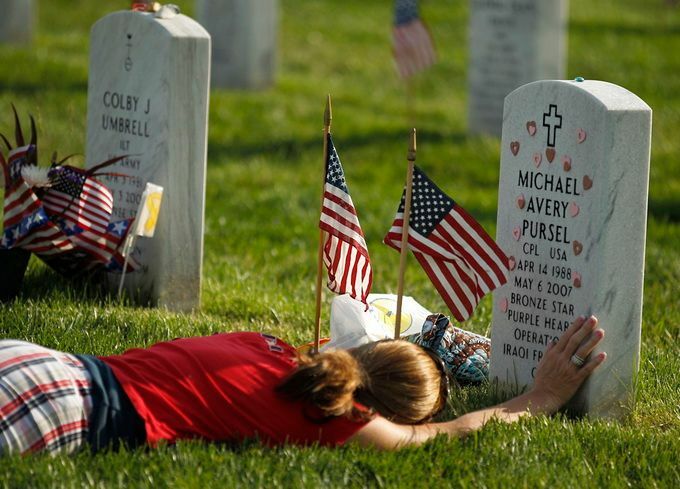 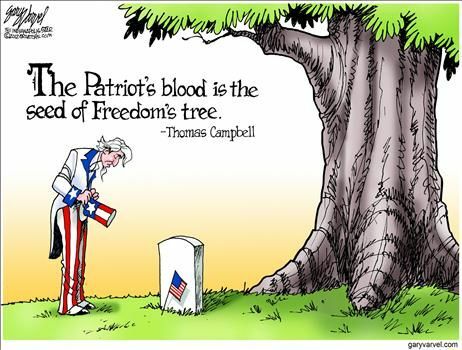 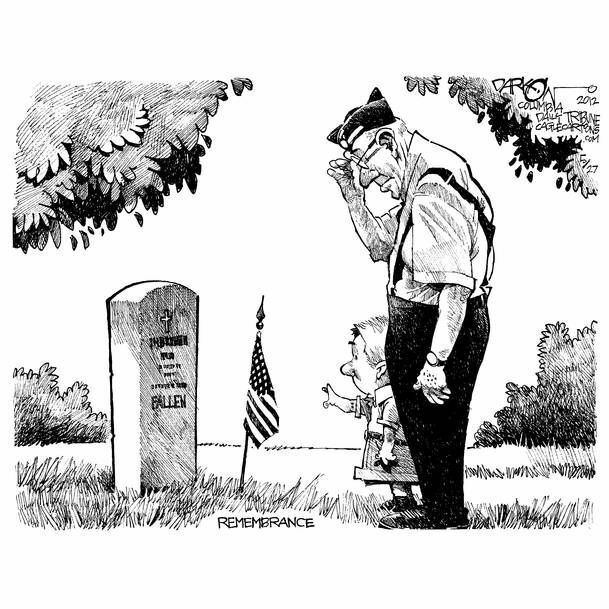 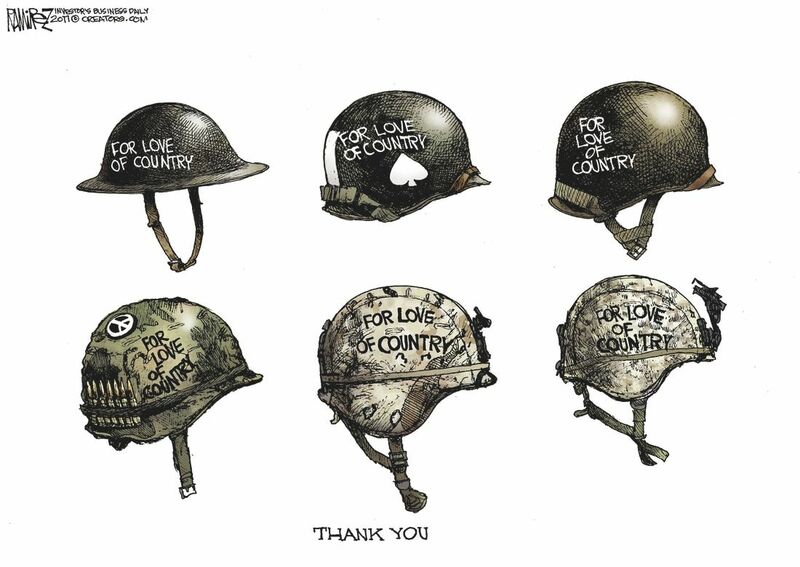 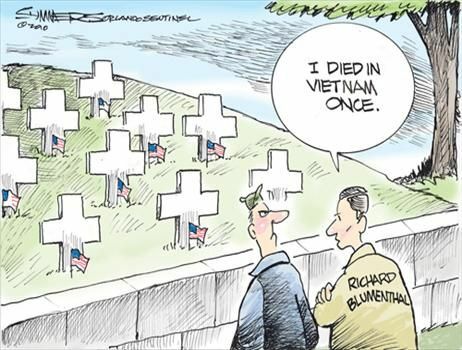 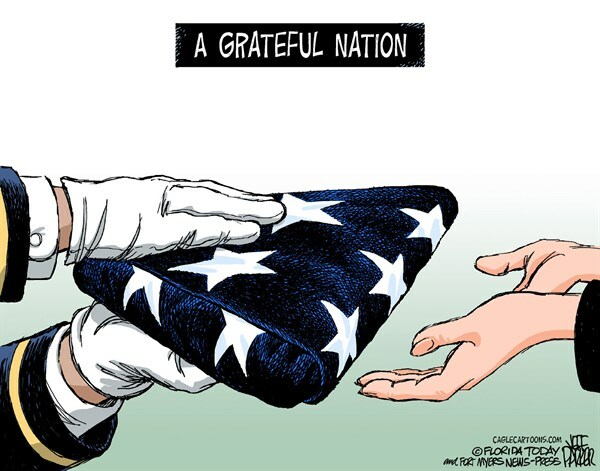 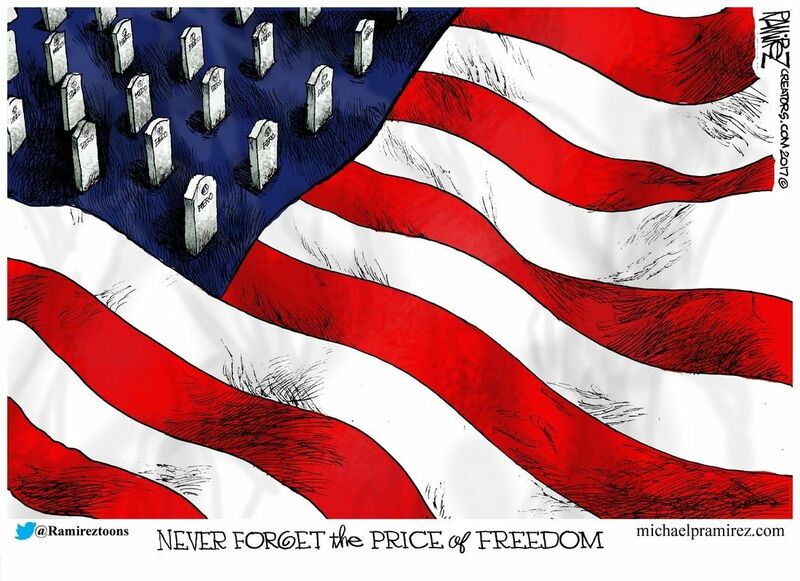 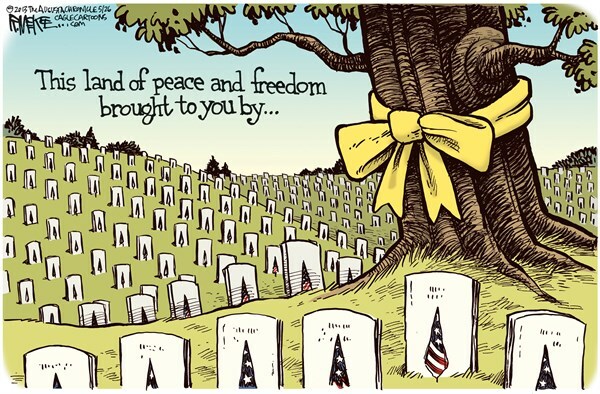 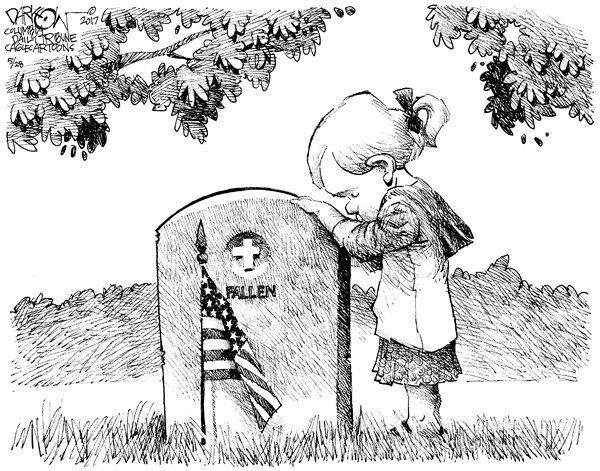 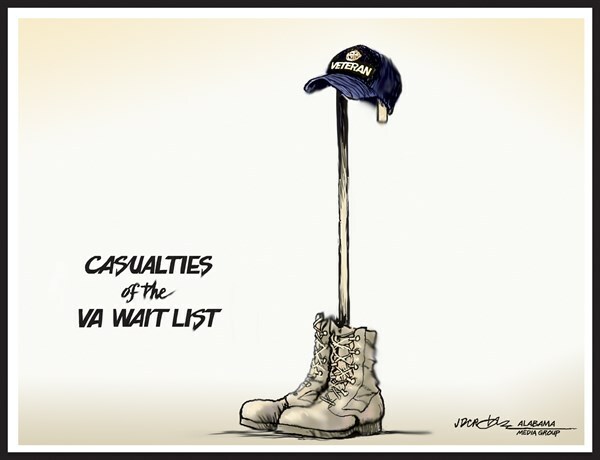 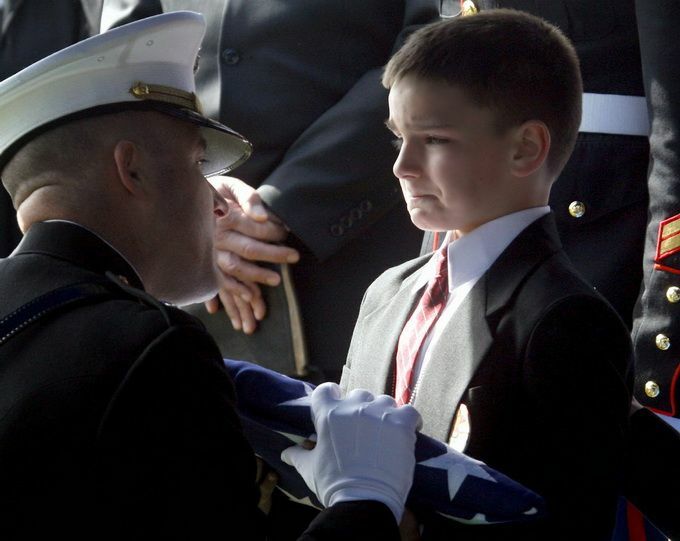 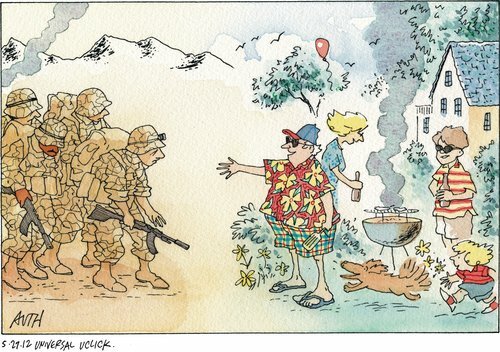 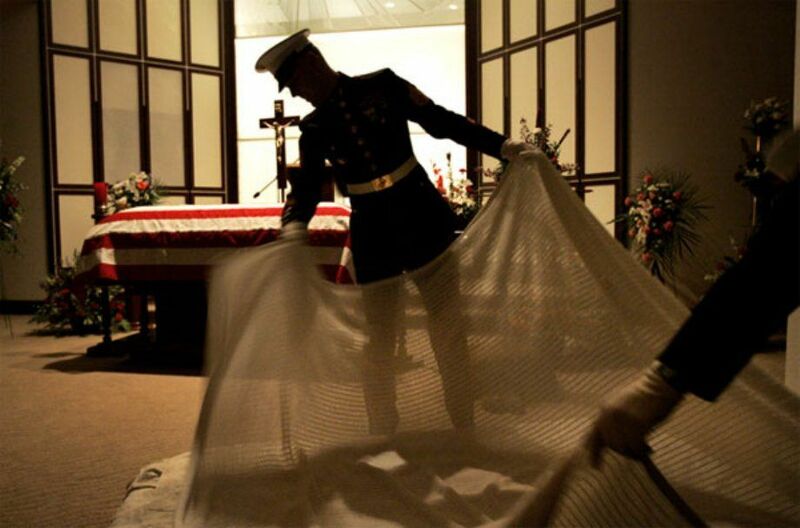 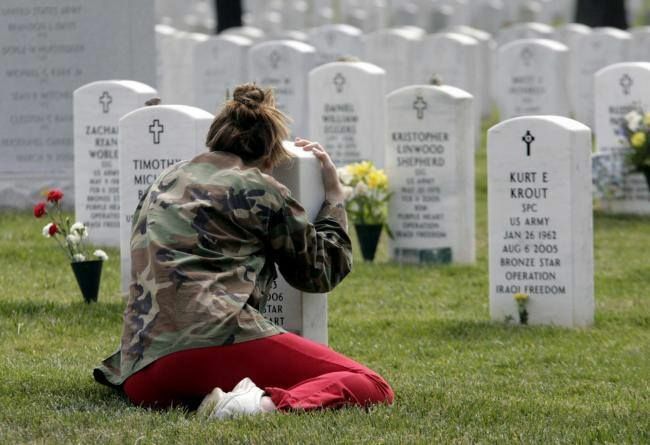 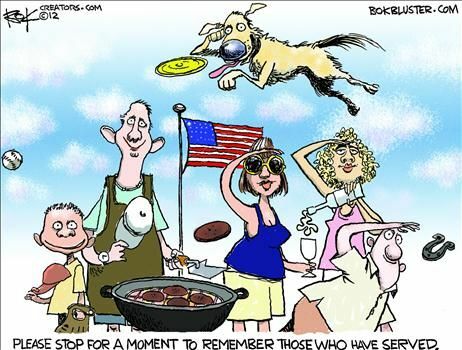 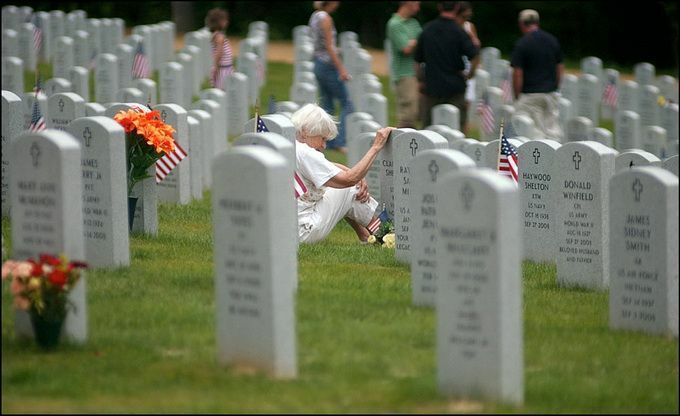 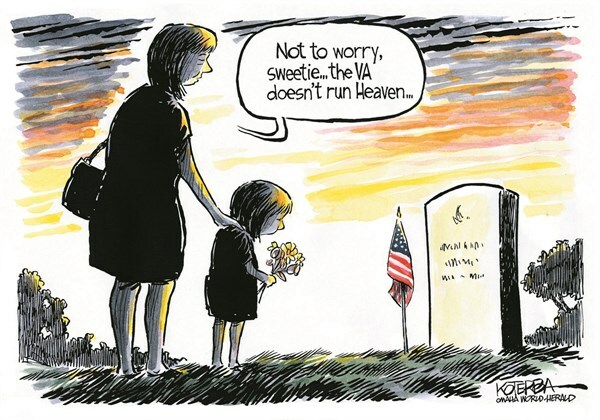 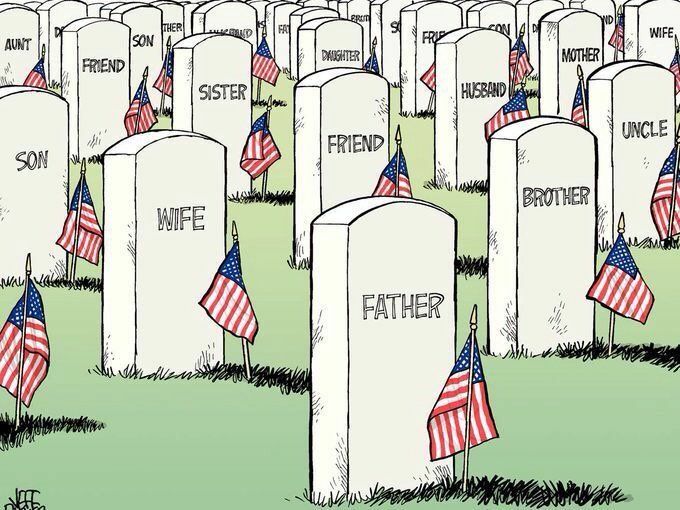 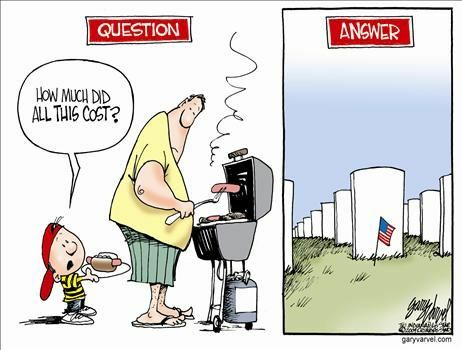 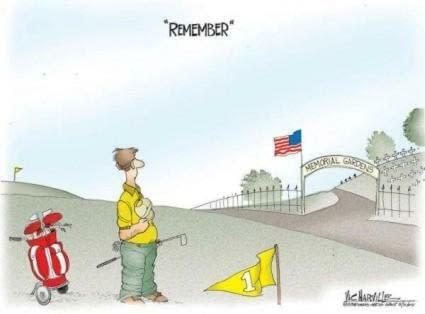 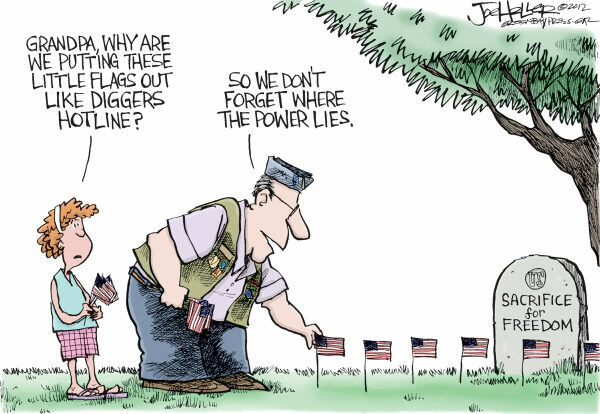 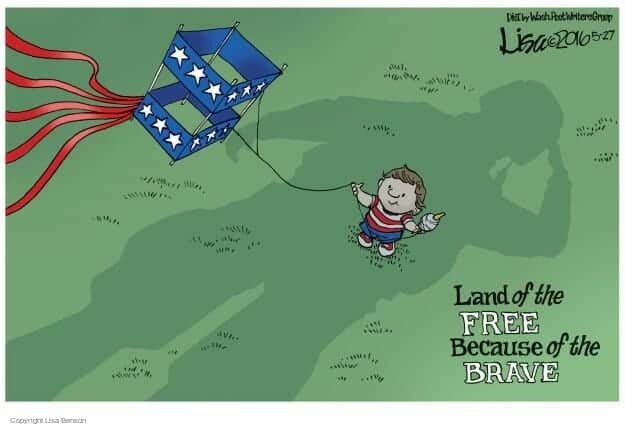 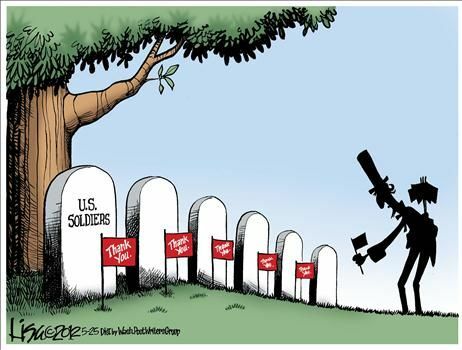 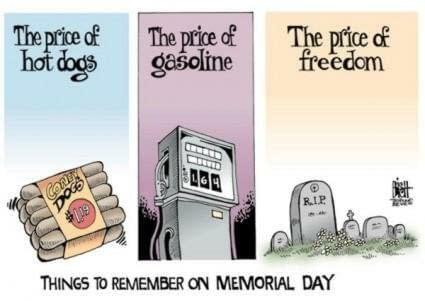 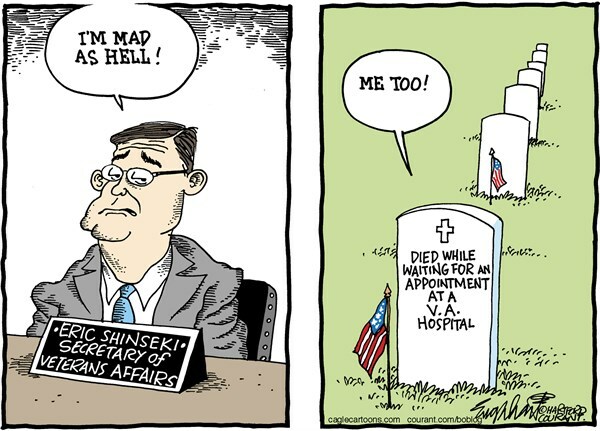 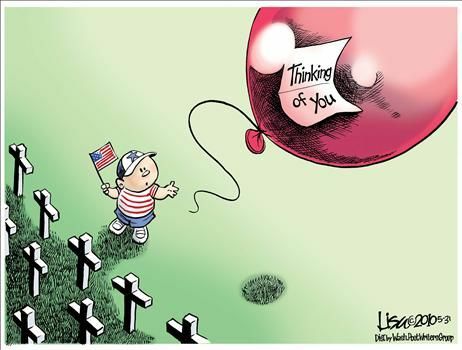 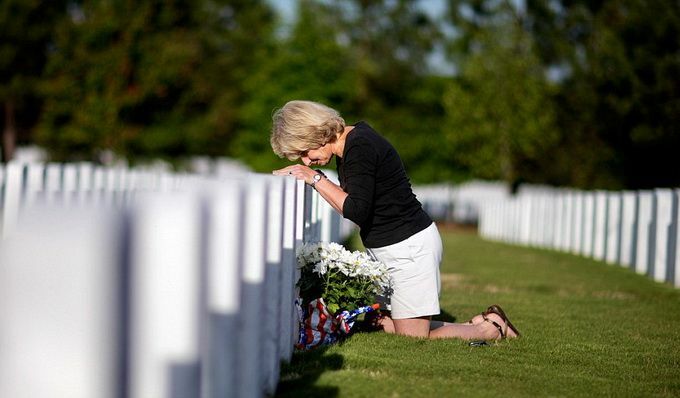 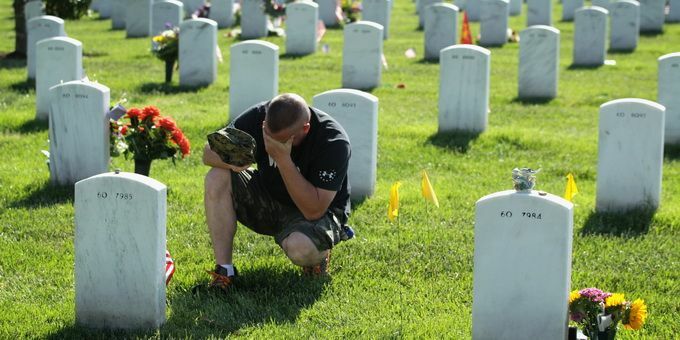 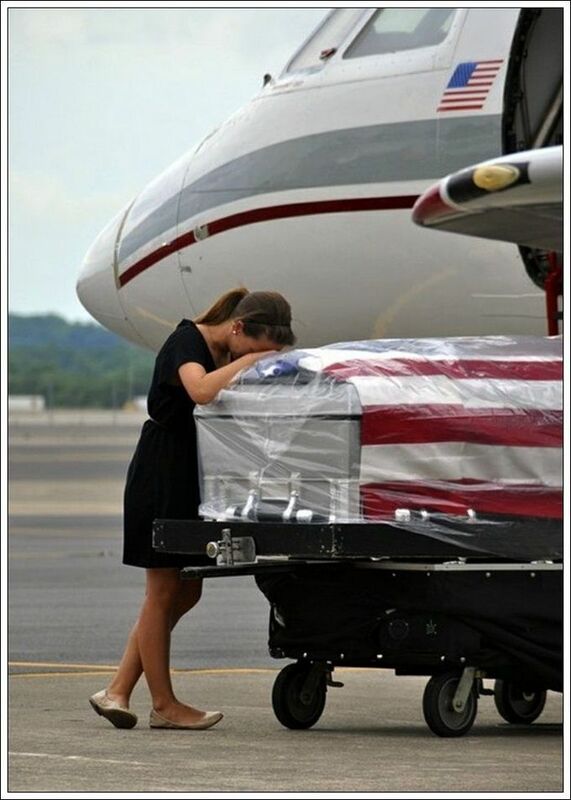 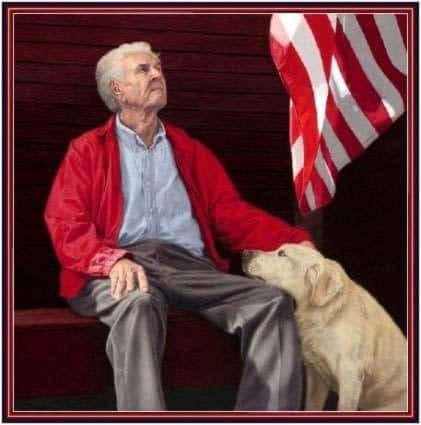 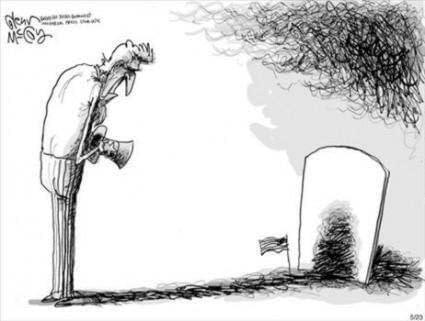 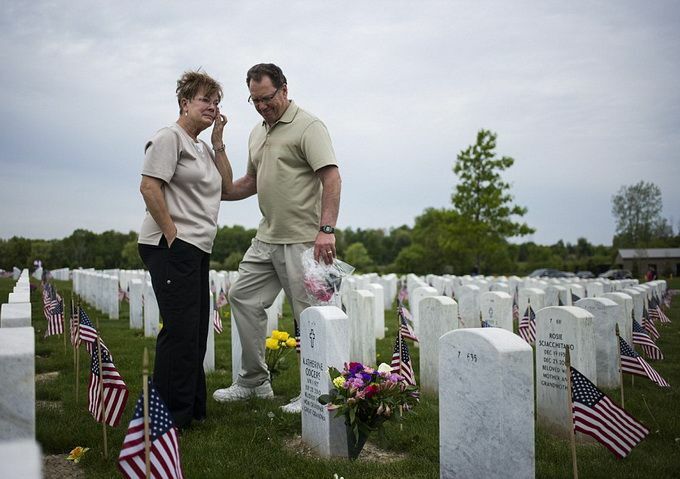 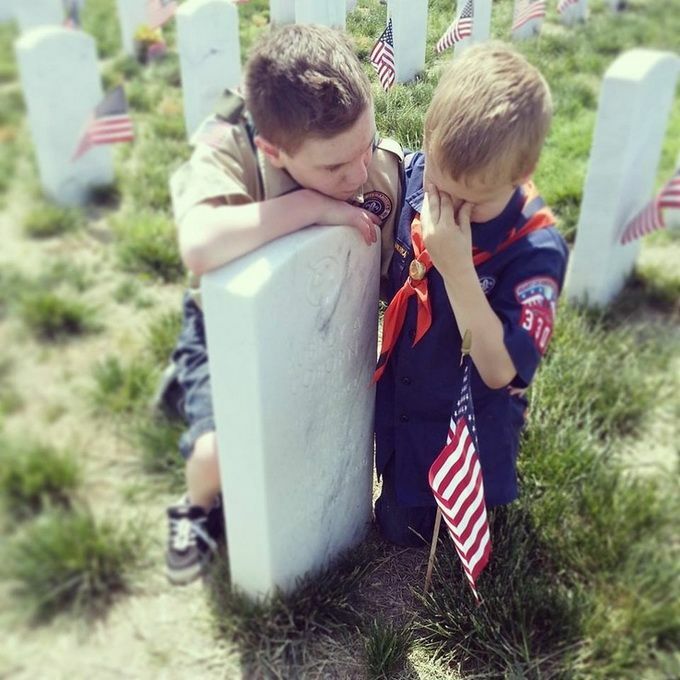 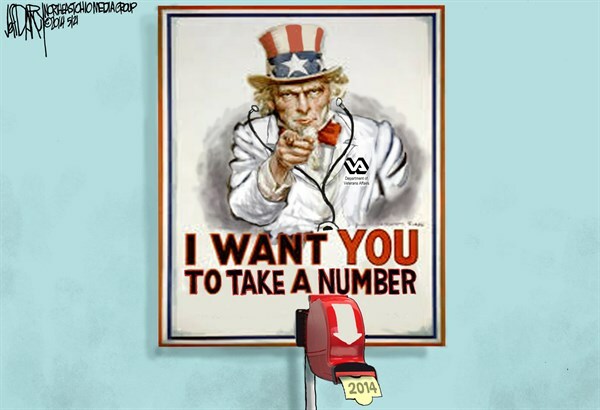 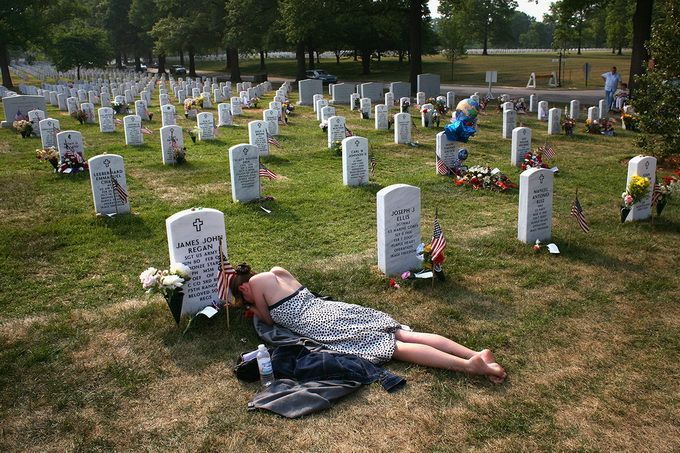 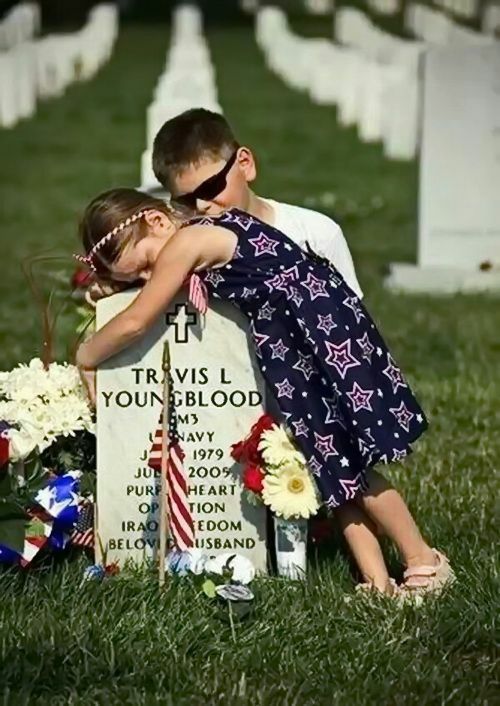 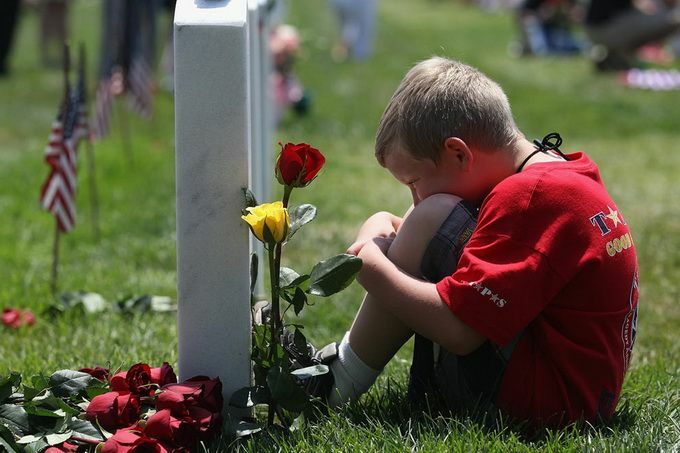 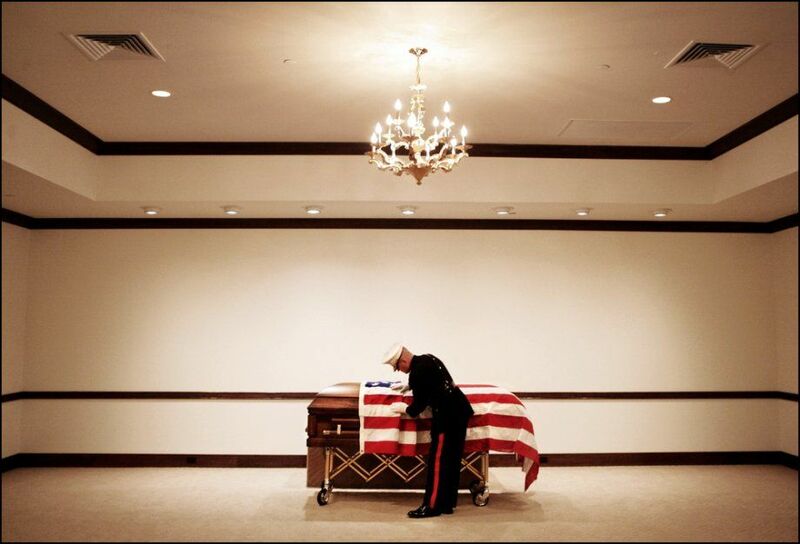 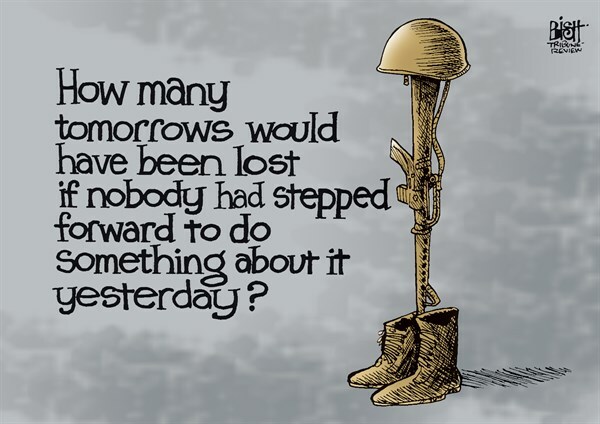 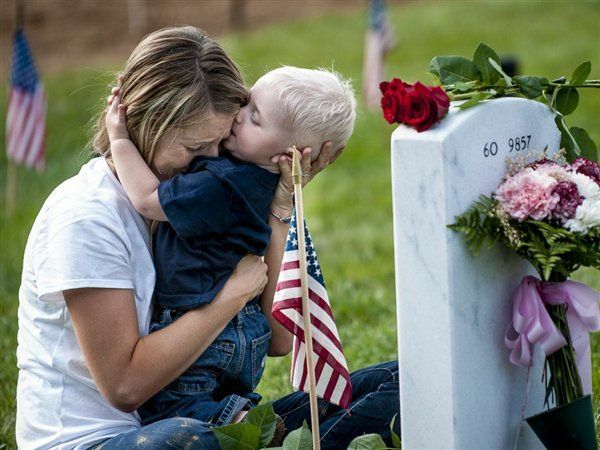 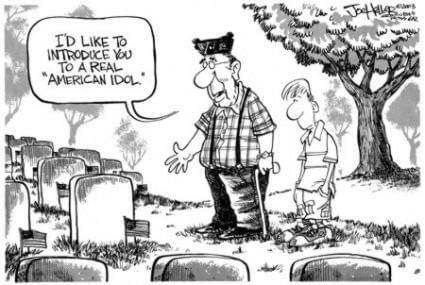 While the speeches and cartoons are perfect for this Memorial Day… they do not express the loss persons individually feel that express our Nation’s loss through their pain. 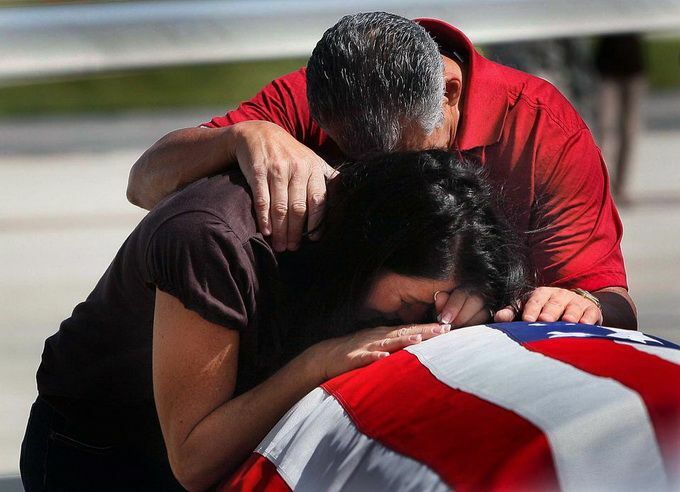 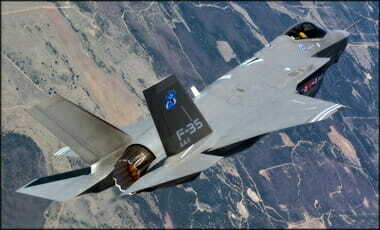 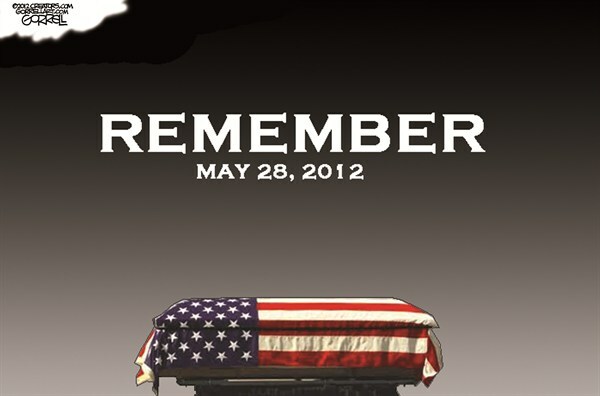 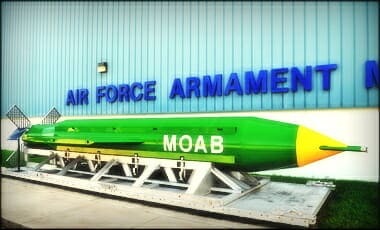 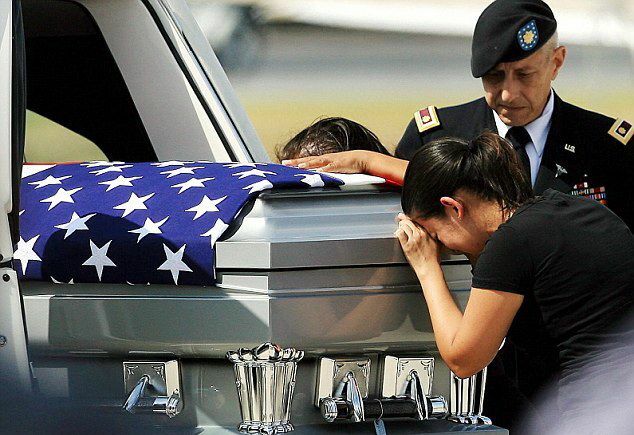 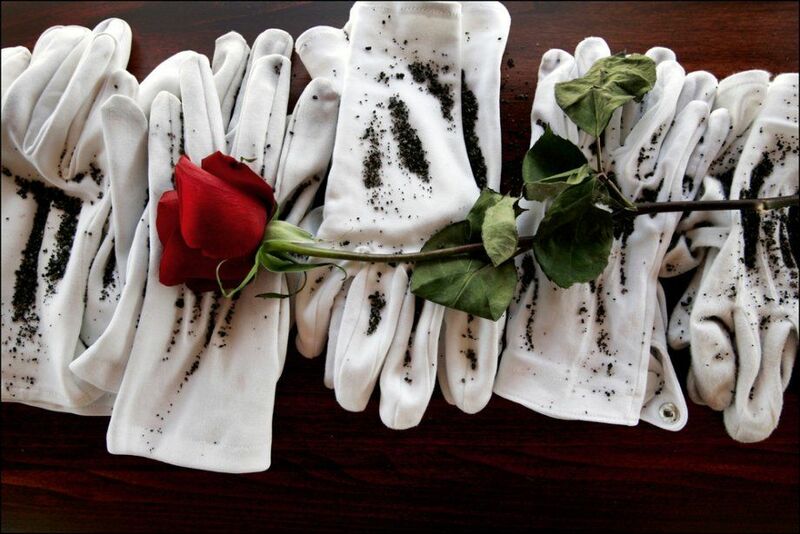 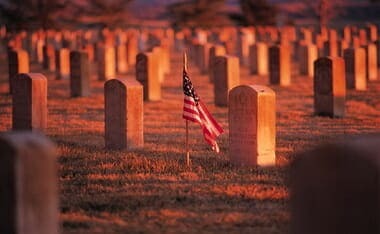 Pray for the families of the fallen, always. 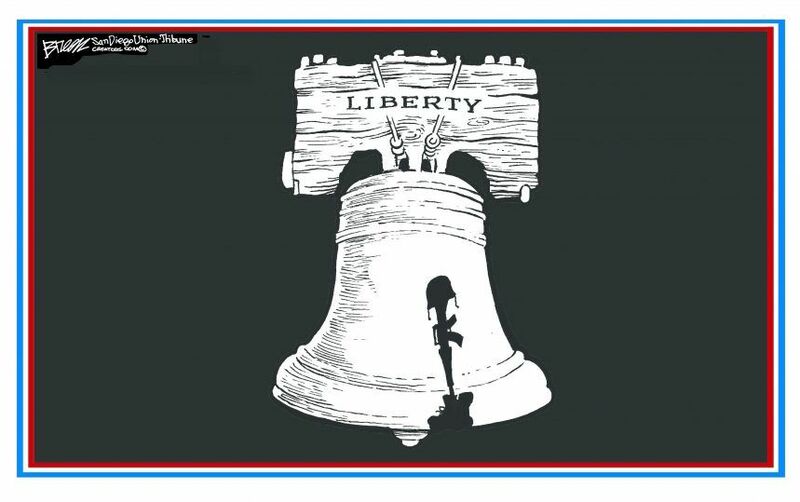 Pamela Dee Gaudry, Georgia physician, took to Facebook on Saturday to criticize Delta Airlines for stopping her from singing the national anthem after her flight landed in Atlanta. 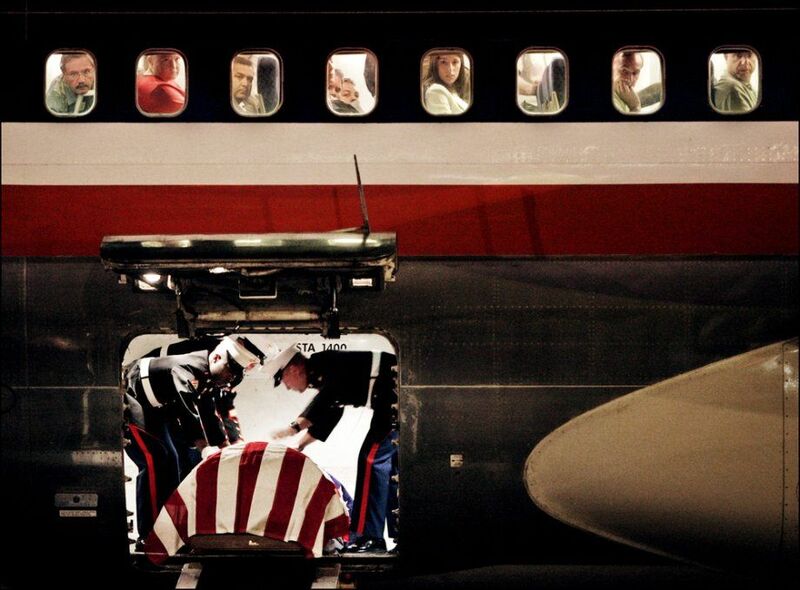 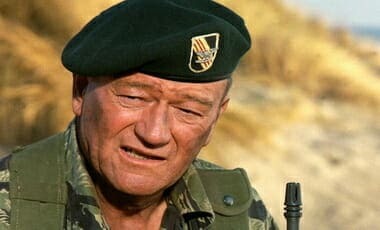 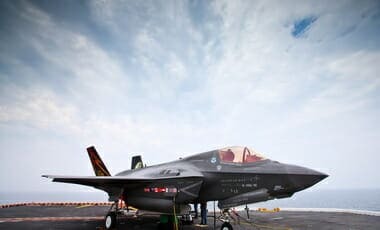 According to Gaudry, an announcement was made that the remains of a soldier were onboard the flight and passengers were asked to sit quietly in their seats as the transfer was made. 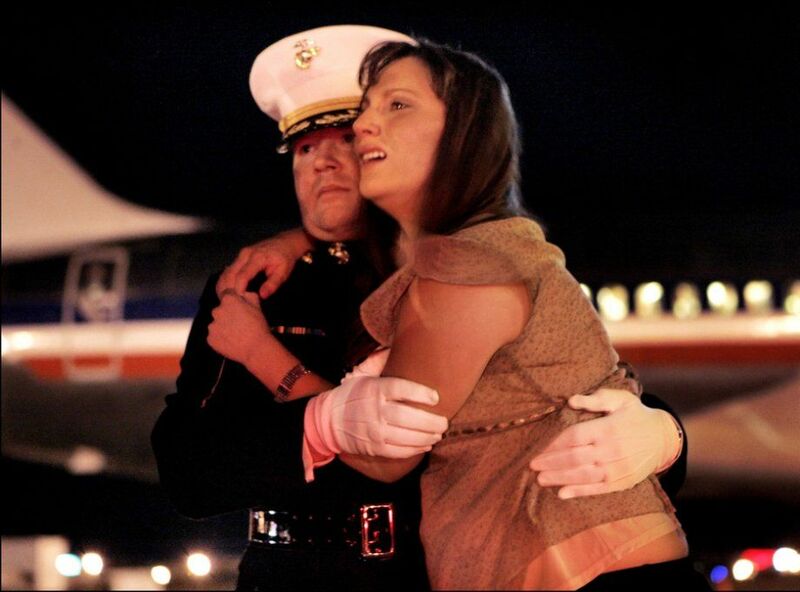 Gaudry then started singing the national anthem to honor the soldier, which is when a flight attendant allegedly told her to stop as it might offend passengers from other countries. 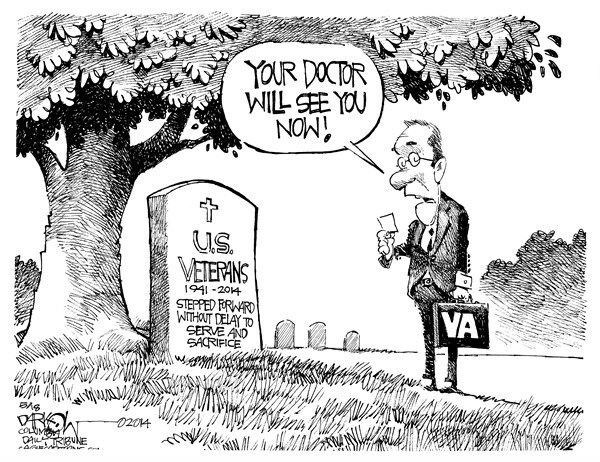 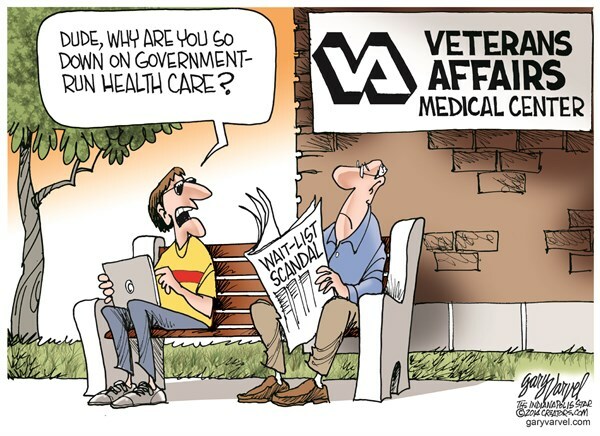 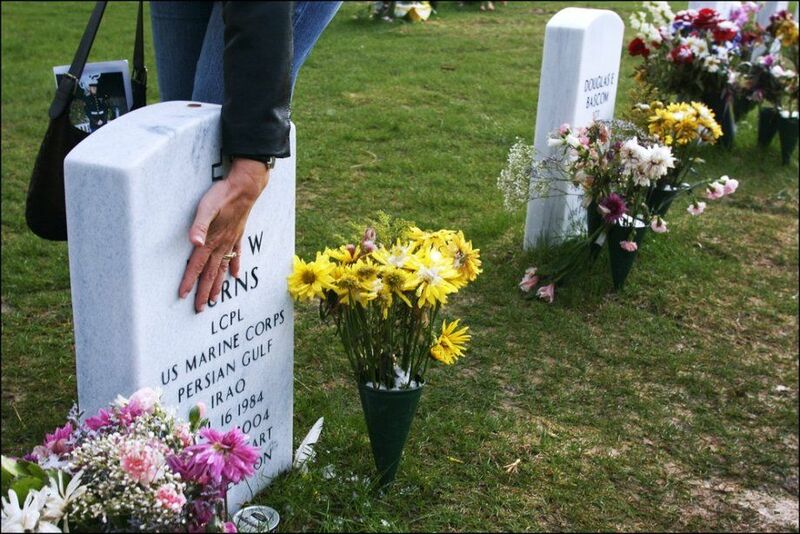 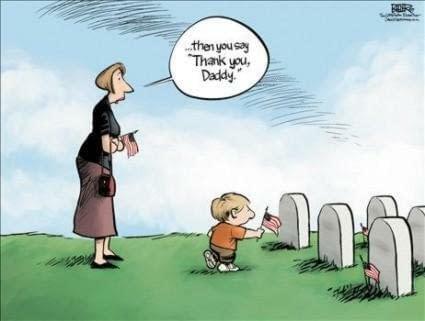 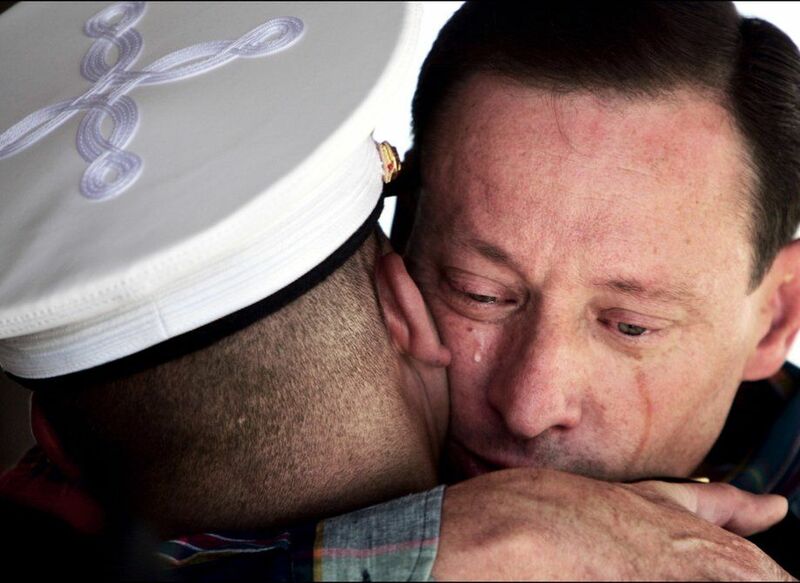 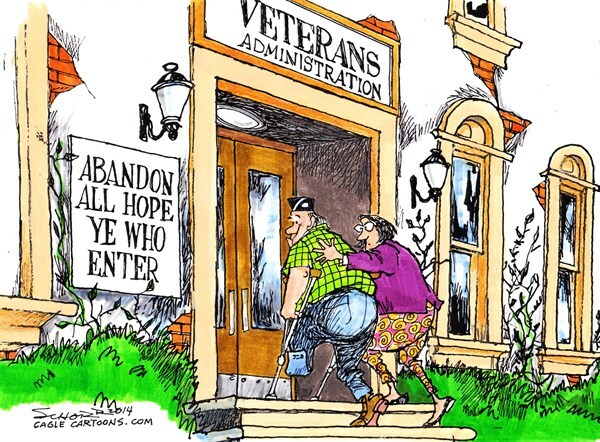 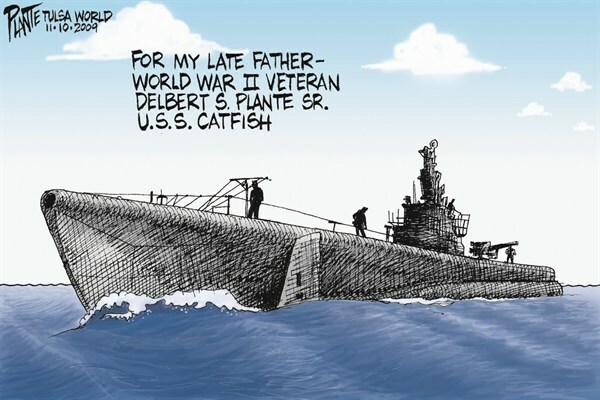 Veterans Day stands for a lot of things to many people. 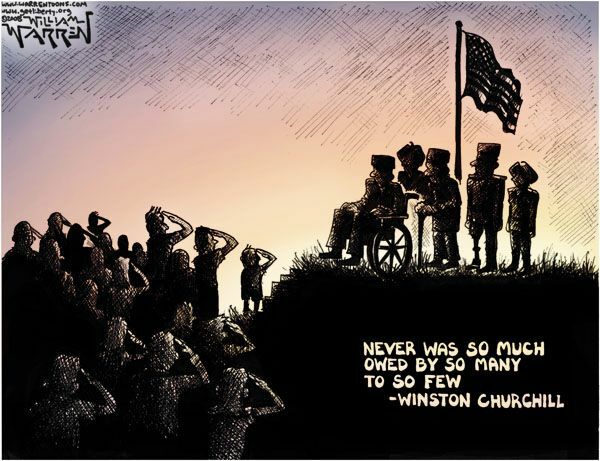 But for the men and women who served, it’s personal. 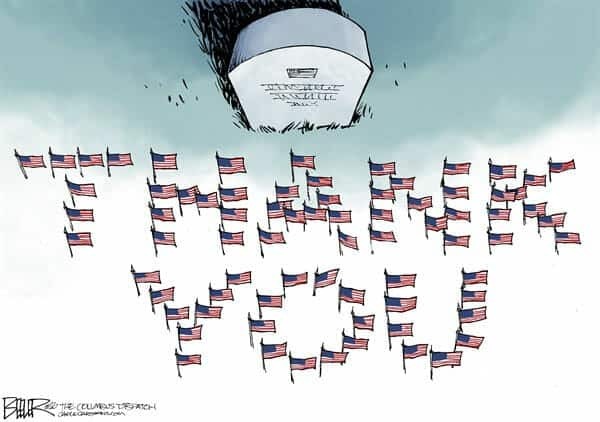 In this feature we hear from three veterans of different eras of U.S. military history on what Veterans Day means to them. 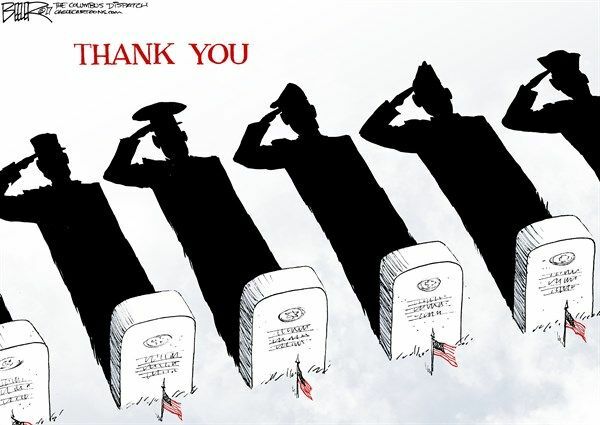 A very special thank you to Troy Taylor, Steve Evans and Wayne Matter for telling us their story.